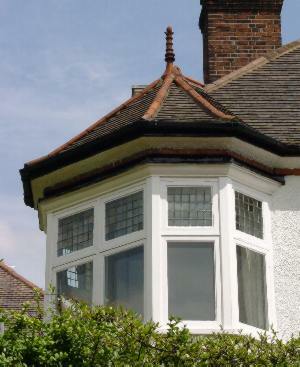 Most houses of the Victorian and Edwardian periods had sash windows throughout; only in the Arts and Crafts and Edwardian mock Tudor styles was the casement style typical. The earliest sashes had no pulley sets; the windows were pushed up and wedged open. The window was set at the outside of the wall. The next stage saw the introduction of boxes with pulleys, ropes and weights. 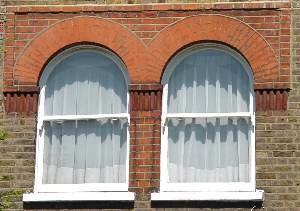 The 1709 London Building Act specified that the windows should be recessed into the wall to reduce the risk of fire. This rule did not apply elsewhere. 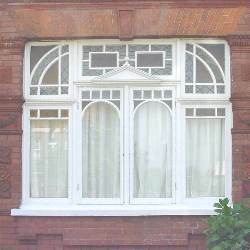 The 1774 London Building Act specified that the windows should be rebated fully. 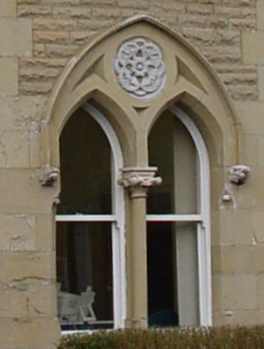 In 1820 it was made a national requirement that windows be fully rebated. This 1820's house from Belfast still has its sash windows unrebated. The window is uncorded and so has to be wedged when open. The head and sill were of wood. The head rotted rapidly and the bricks above tended to collapse. Larger sashes, going from near the ceiling down to floor level, were suspended on chains rather than ropes. Inside, the windows were painted dark brown or white to match the room décor. In the Georgian era, on the outside, windows were dark brown in plain paint or grained. 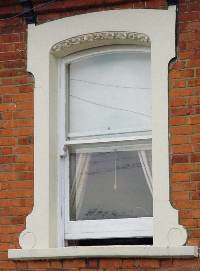 Victorian and Edwardian windows were generally painted the same as other exterior woodwork; typically a dark colour, perhaps with white-painted detail. Plate glass came into widespread use in the mid-1800s once the special taxes on this type of glass were abolished; windows and the panes themselves became larger. 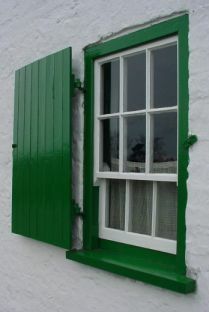 As windows were made from fewer but larger panes, sash horns were introduced to give greater strength. Edwardian bay with casements and fanlights over. Public and street-facing rooms typically had Venetian blinds (wooden slats) or roller blinds, with nets and conventional curtains. Sometimes a fringed and braided silk or taffeta casement blind was used. Swagged curtains were not common. Chintz fabric was popular. Brass poles were used. Researchers at Imperial College London have rediscovered in 2003 that sash windows are very effective at increasing the airflow in a building; they should be open equally at the top and bottom and in hot weather opened fully at night to cool the building for the following day. Blinds allow this airflow while giving shade and privacy. Visit our advice on caring for windows.